Good day to you all Copic lovers , ready for the most festive night of the year? 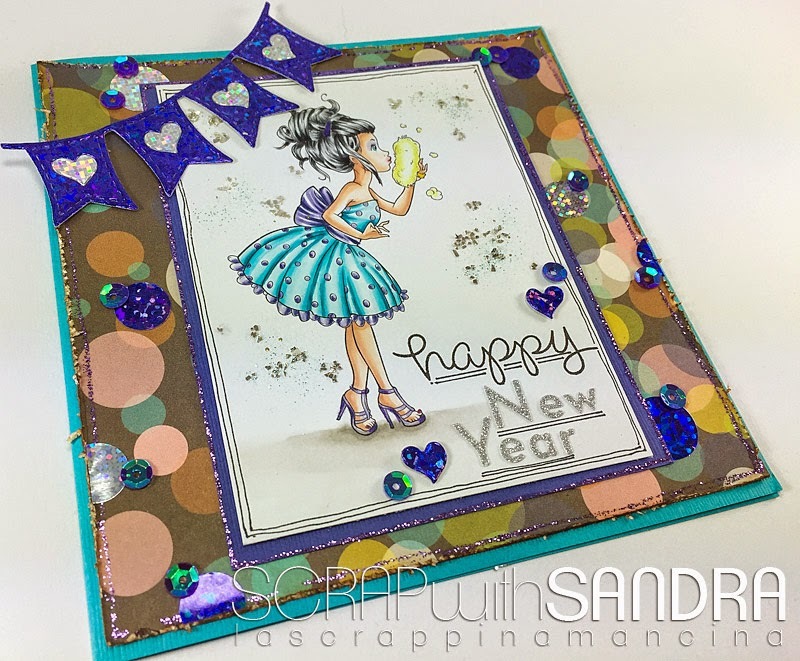 Here is Sandra and with this card I want to wish a very Happy New Year. 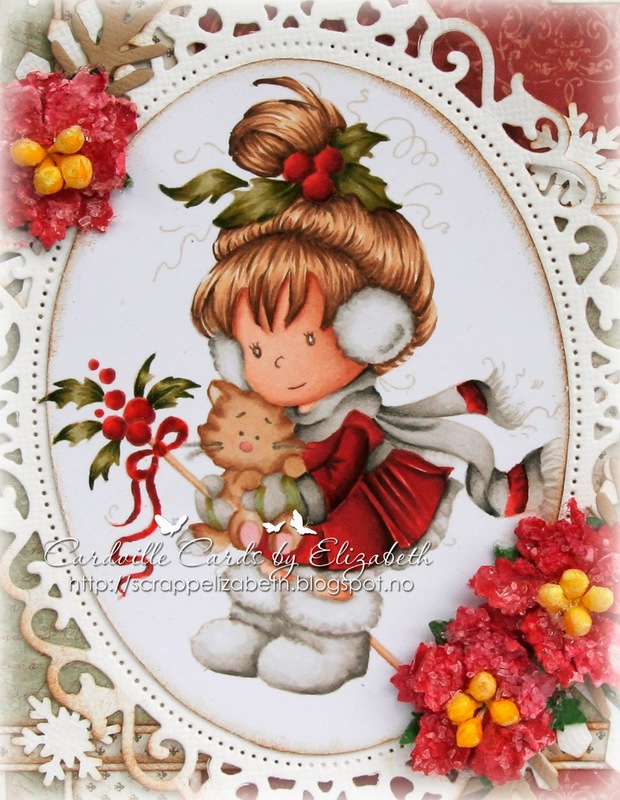 To celebrate the end of this year I chose the digi stamp "She is Charming" from The paper's Shelter. A girl with a beautiful evening dress is preparing for a party. What better way to celebrate the new year that is coming? For coloring I chose a combination a bit special but I really like. I go with colors of BG family with BV family. 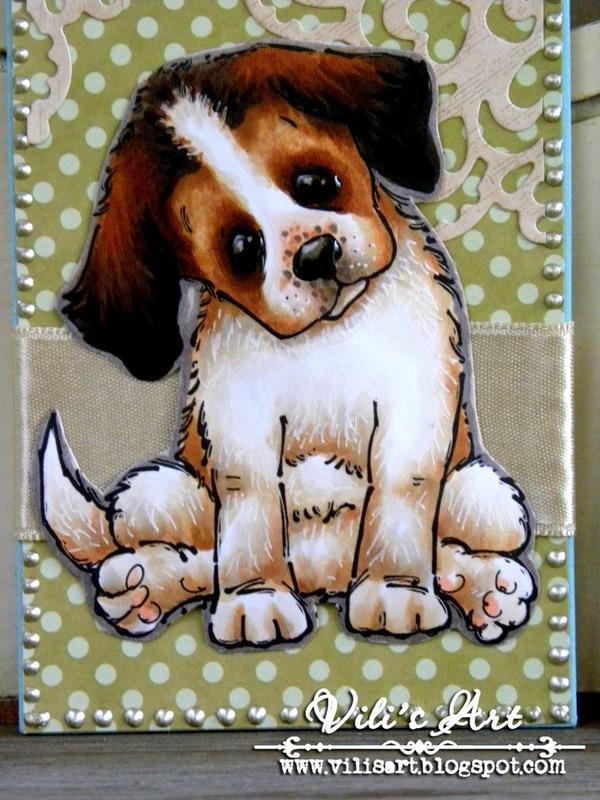 For the card I used bazzil, pattern October Afternoon and an adhesive sparkling paper I had at home for a long time! 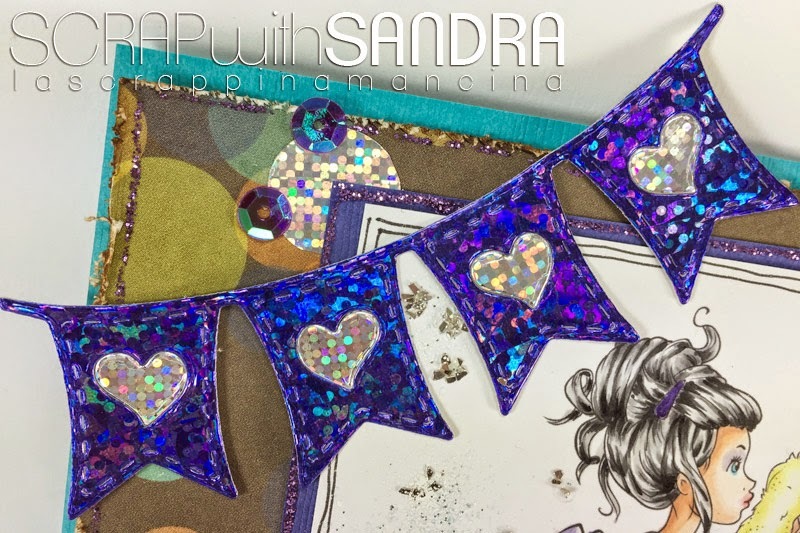 The banner is a die La La Land Craft and the background is illuminated with Frantage Silver. With this project, I come back to renew my best wishes for a Happy New Year, which will bring happiness and peace to you and all your loved ones. See you soon next year !!! Winner Challenge 34 Anything goes! and hope that you will join us also in 2015. Finaly we have a winner on Challenge 34 Anything goes! 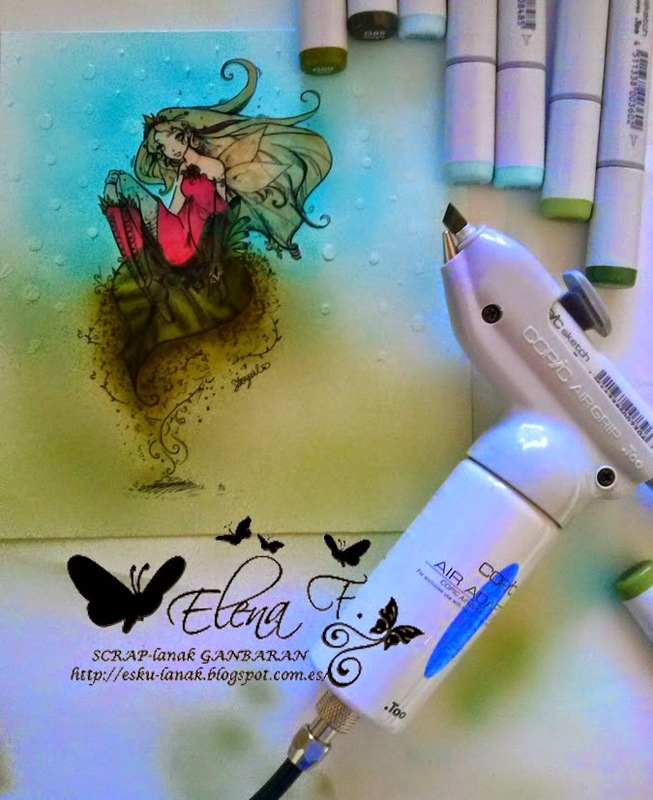 it is a pleasure to see her work with our Copic products. Send us the numbers of the 3 sketch markers you want to recieve. I wish everybody one more successful 2015; one, that makes dreams come true! on this special day it's my turn to publish a new creation and I have another art journalpage for you, because I just love making journalpages. Making art journalpages is such a lot of fun, everything is allowed, no bounderies what soever. 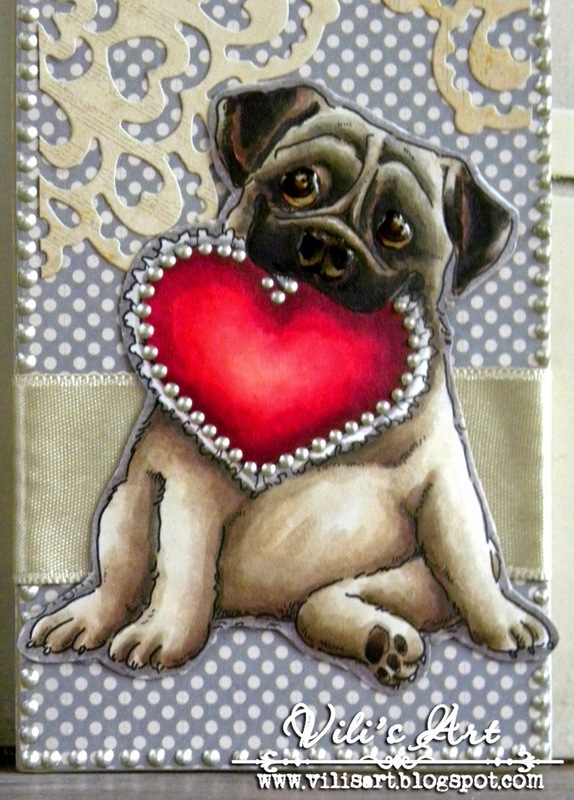 You can write down your feelings and paint/ draw on top of it or you just make a nice page using a lovely image. 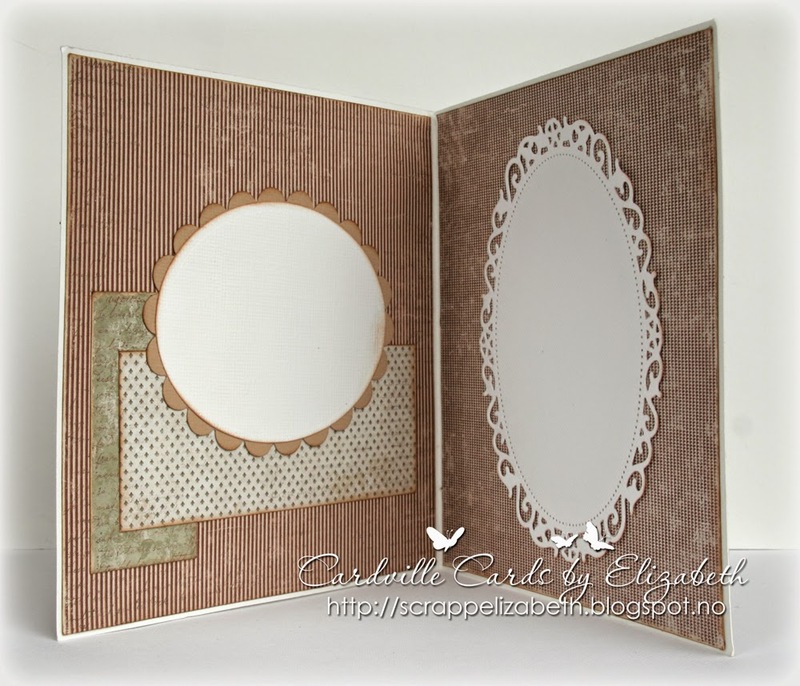 At first I created a background using my Dylusions ink and Dutch Doobadoo stencils. The stencils I used are flowers, diamonds, stars and screen of stars. 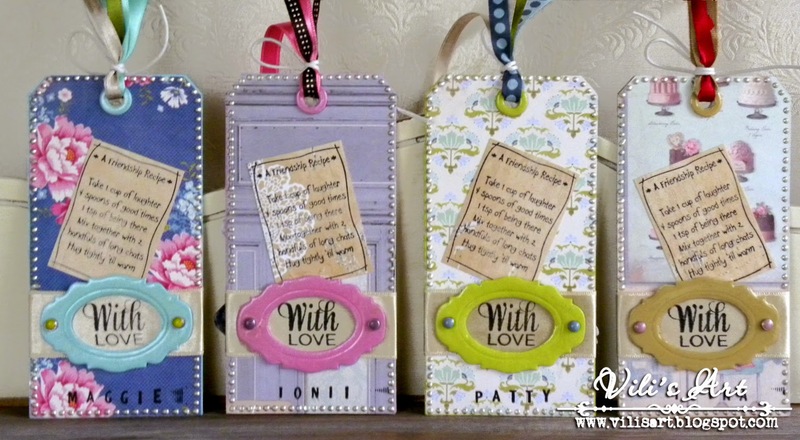 After that I did a little stamping using a script stamp. The image is by the East Wind (check them out if you don't know them yet, they have some wonderful images) printed in a large size on copic paper. BG01, 09, 57 and FBG2. The copic colours go so well with my favorite Dylusions ink that I really love using them both on my pages, because both have such wonderful bright and cheery colours. New challenge: It's a man's world! 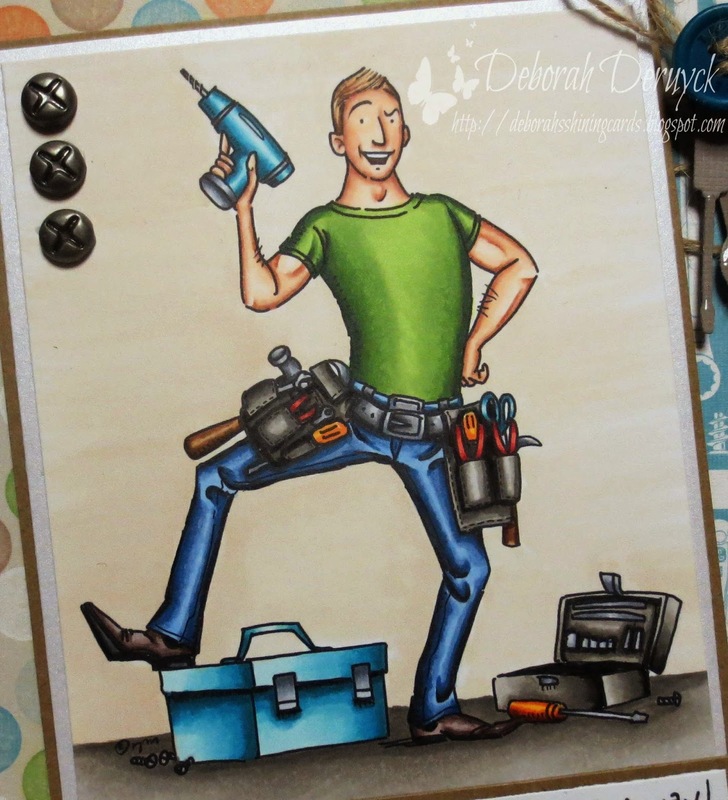 Deborah here today with the new challenge for the Copic Marker Europe blog. First, I would like to thank you for the beautiful entries last time, it was a pleasure to take a look at them! The winner will be announced on friday, December 26. So create a card for a boy or a man with your fabulous Copic Markers. My boyfriend had his birthday this month, so I had to make a special card for him. We bought a new house last year and we had to rebuild it. Every free hour he was busy with working on the house. I'm so proud on him! 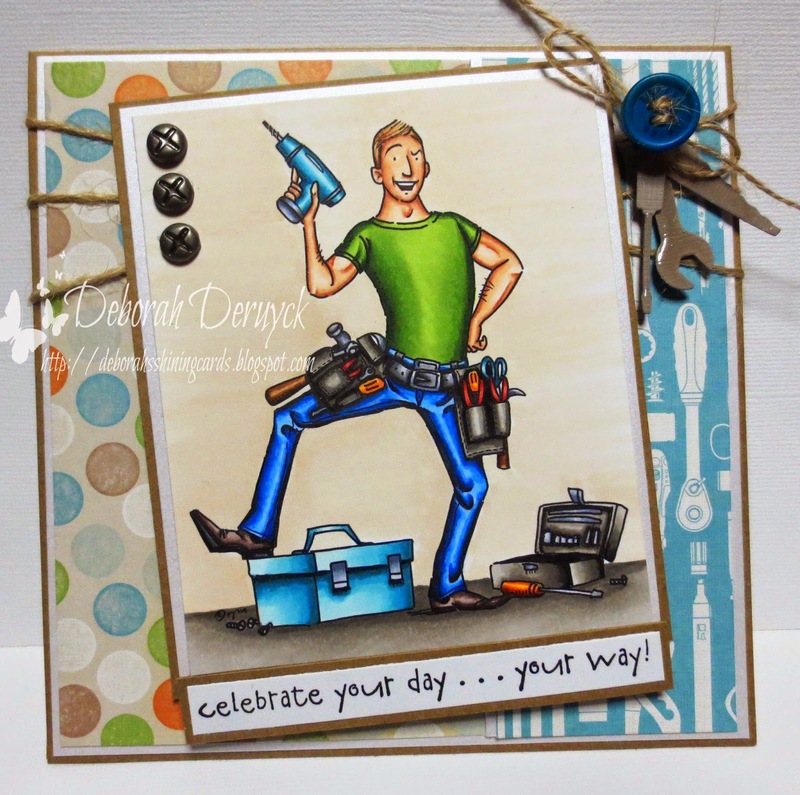 The image is "Mr Fixit" by Mo Manning, her boysstamps are amazing!! The paper is from an old collection of BasicGrey "Bowties". I've addes some die-cuts from Memorybox and some screw-brads. I've kept it very simple. before the end of 20th Januari 2015. 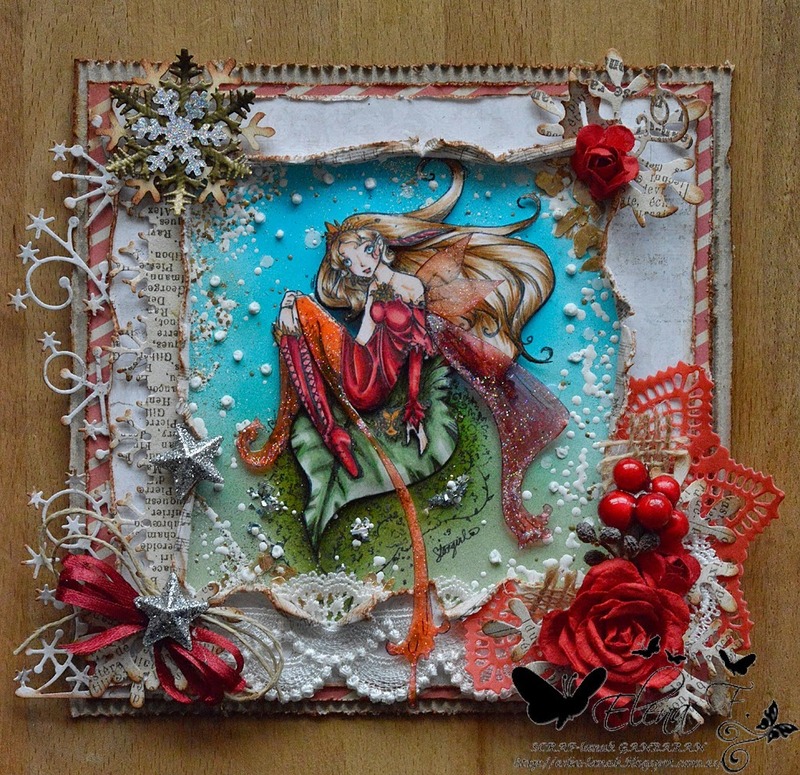 The winner will be announced 23th of Januari 2015.
and I assume you have all the Christmas cards ready and is sent. 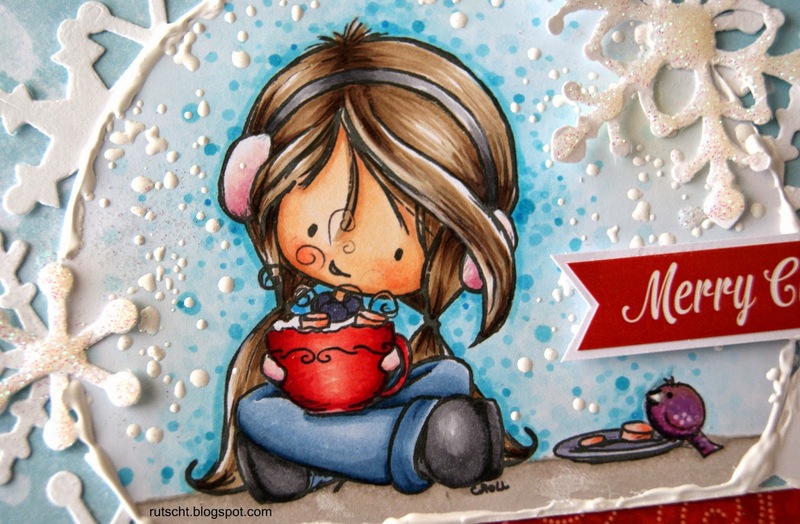 Today I show one of my last Christmas cards for this year. with a slightly different technique from what I usually do. to get some more fur-like appearance. to get an effect of long fur on the cat. and concludes with the darkest color. 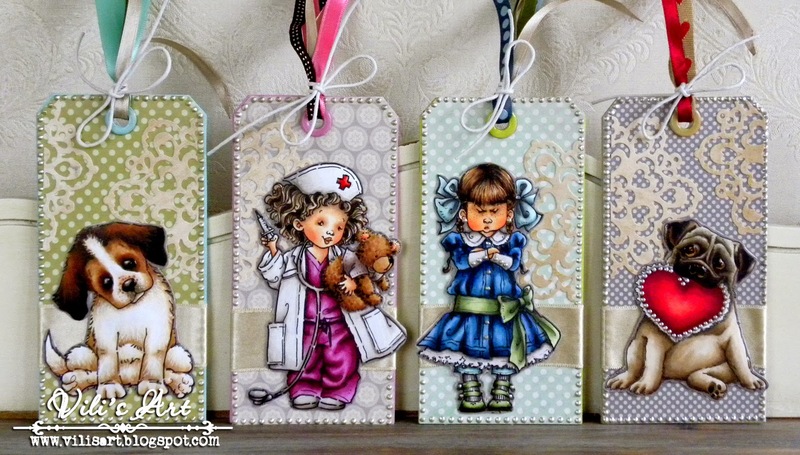 and the paper from Maja Designs. 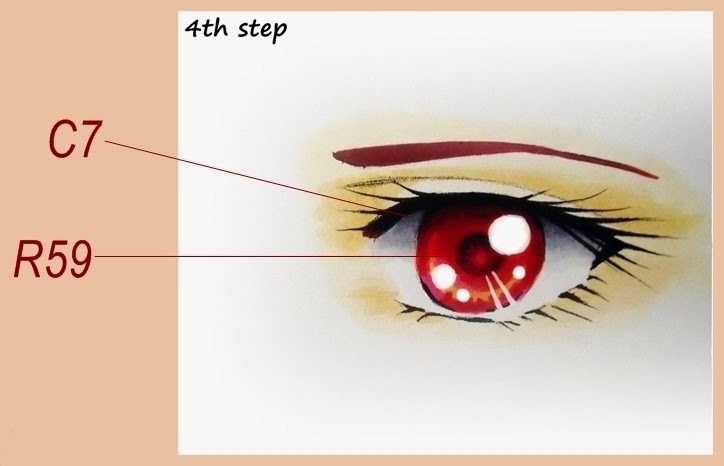 Today I will show you an easy way to colour manga eyes in 4 simple steps. I used a Saturated Canary image again, one of the latest drawn by Krista; I love her because of her hair and of the bubbles all around the image! I started colouring skin and hair with one of my favourite brown colour combo and then I coloured up her dresses. I generally colour the background at the end. Here I used my favourite tecnique that is the "Confetti Background" with lots of dots that are bigger and very close one to another near the image and smaller when you colour away from the character. I used some different markers to achieve this result, two blues, a blue-violet and a warm grey to give the background a "dirtier" look. 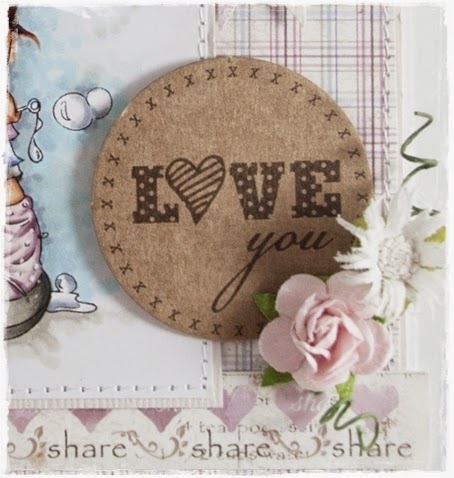 I used Papers form Maja Design and I also added this lovely craft die cut from Dutch Doobadoo, love them, they makes cards special! thanks for stopping by, I hope you all are having a lovely day! Hello everyone! 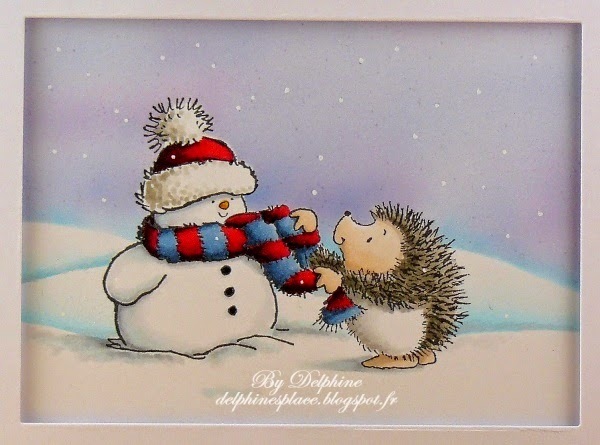 It's Delphine here today, sharing another Christmas card, with a cute image and sentiment by Tiddly Inks. 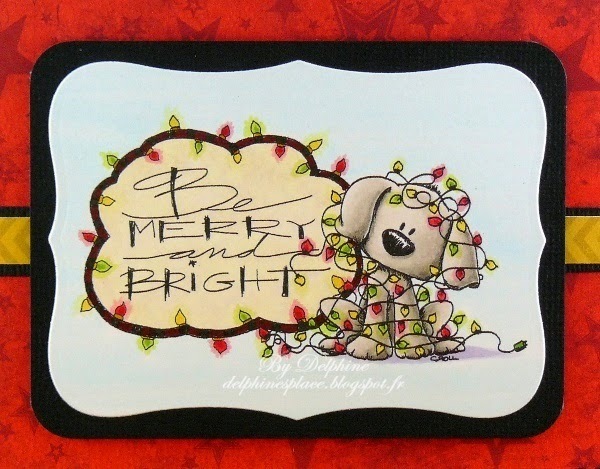 I printed my image called Be Merry And Bright and coloured it with my Copics. I started with the background as always, using a very light blue. I coloured all the lights last, using three Copics each time, first colouring the inside of the light with my medium shade, then outside the light with my lightest to give the idea of lights being on, then added a touch of my darkest shade inside the light. 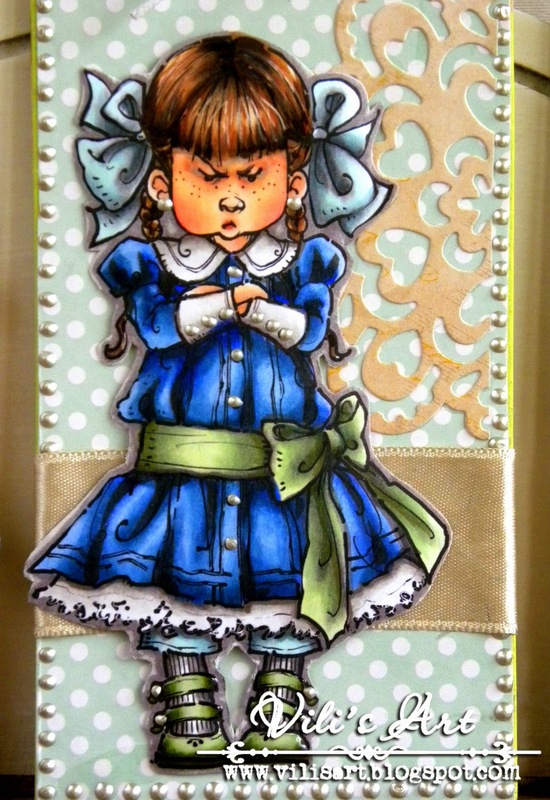 I die cut my image with a Spellbinders Label die and I used DPs by Bo Bunny. Hi everyone, Åsa here today again with some new inspiration. It´s not going to be a Christmas card this time, alltough it´s almost Christmas. The papers are from Gummiapan, and I have colored all the edghes with distress Frayed Burlap. I really like to add shadows around and below the image to make it pop a little more. This time I added the shadows on the right side of the image to strengthen the impression of the lightsource. I like to wish you all a very Merry Christmas! My name is Sarit Sabbag and I'm from Israel. I feel excited and honored to join these talented ladies. When I was a kid whenever I was asked "what do you want to do when you're grow up" my answer was "to work at Disney, coloring all those cartoon images" why do I tell you this??? Because for my first entry I decided to combine these two things I love, Cartoon images and Copic. For the skin I wanted to try a new combo. E50, E30, E11 and for the cast shadow I used V93. For the dress I choose the YG family because they go together with the hair. I had super fun coloring her. Hope it inspire you to try coloring other images. Elizabeth here today to give you some inspiration for your Christmas card- coloring. 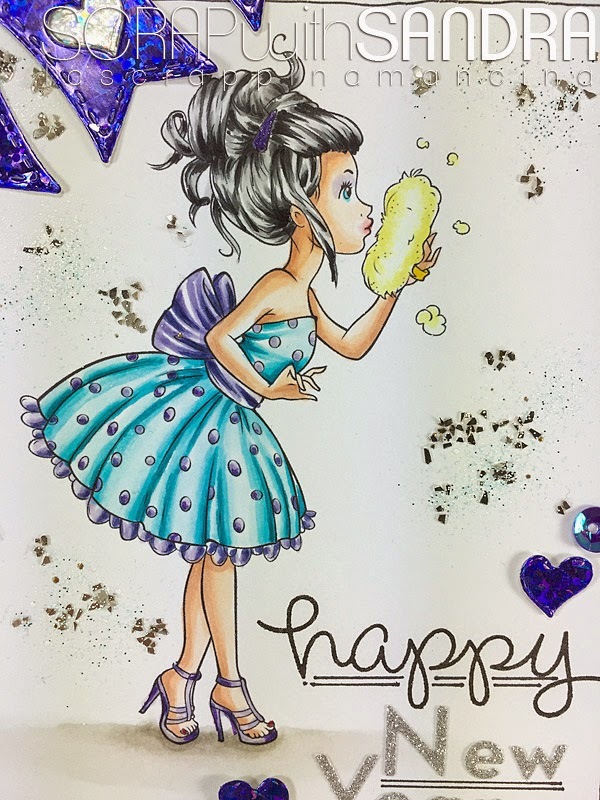 I have colored this cute Whimsy Stamps image using the no-lines technique. 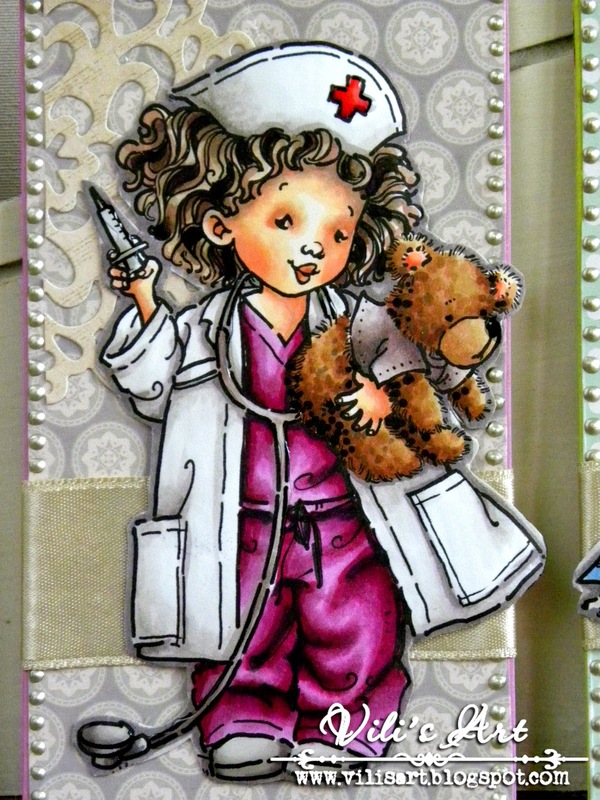 I stamped the image using Memento Tofee Crunch ink, wich is light brown. When I color the lines wont show, and it gives a soft look on the image. 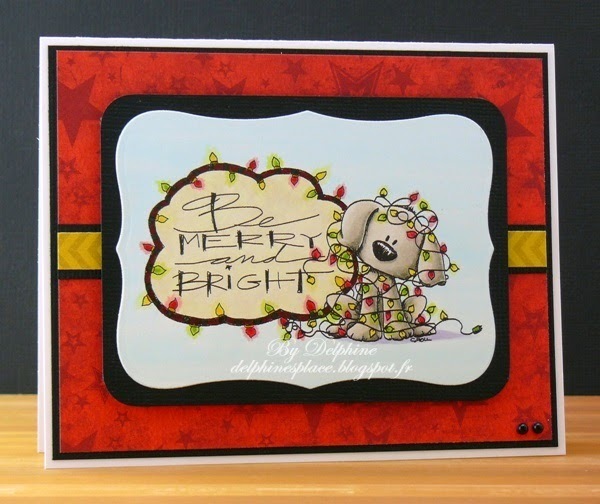 I used Maja Design papers in traditional Christmas colors, red, white and green. 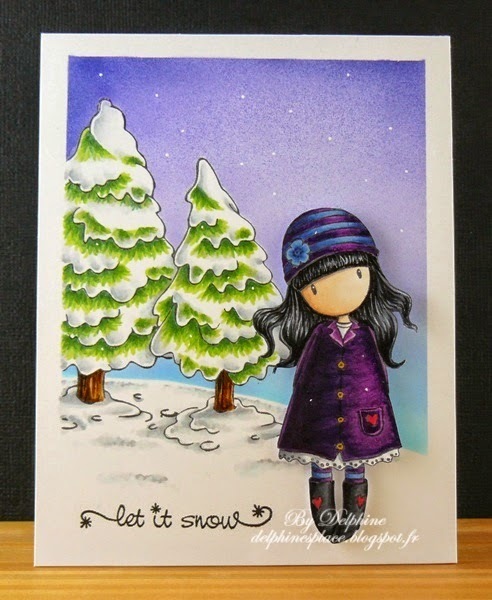 Here's my image, it's named Berry, made by Sylvia Zet for Whimsy Stamps. Hope you are inspired to play with your markers ! Hello everyone! 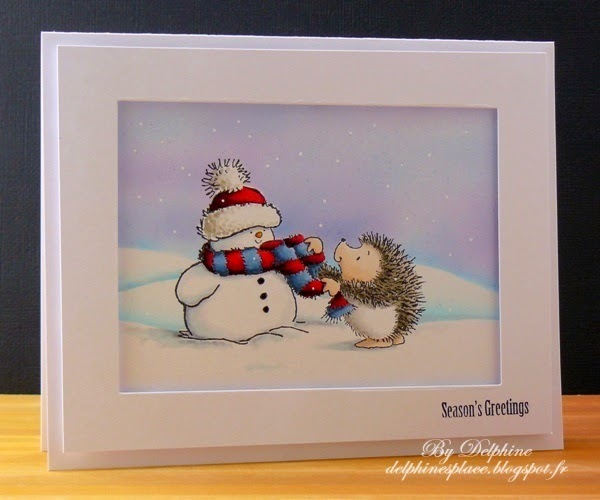 It's Delphine here today with another winter scene - now is really the time to make winter cards! 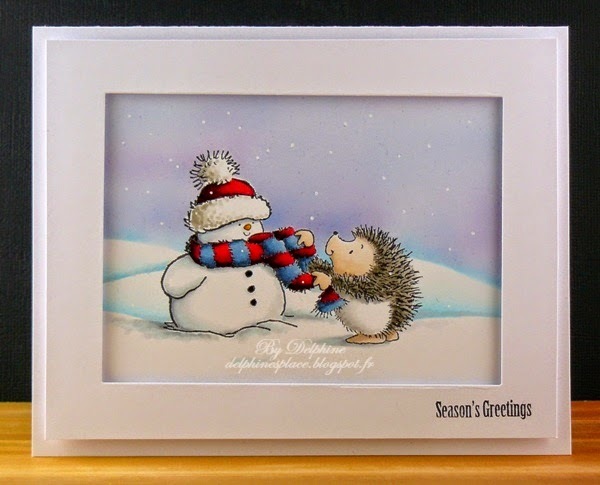 I have used one of my not so recent Penny Black stamps called Snowy & Hedgy. I stamped and masked my image, added a couple masks to create the hills and airbrushed the background. I then coloured my scene and thought I would add a frame inspired by a number of cards I have seen recently. 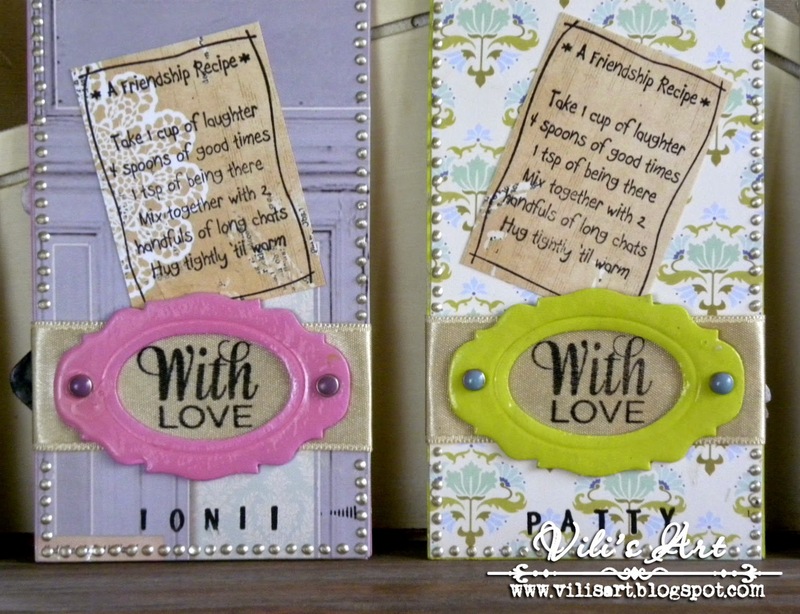 I cut a rectangle with a die, stamped a CC Designs sentiment on it and put it on foam squares. This is my Christmas contribution for Copic Europe. 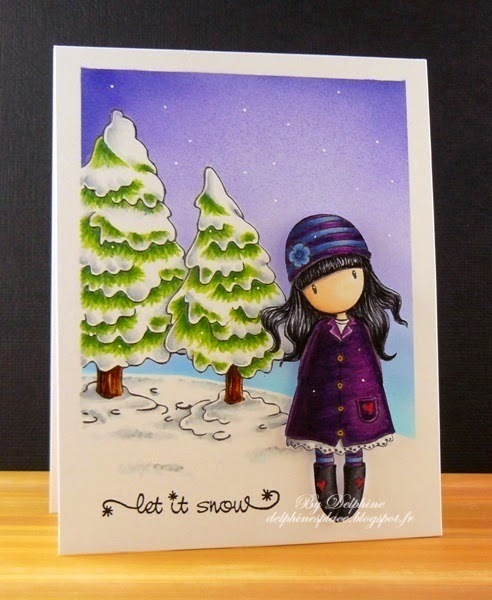 It is a very simple card appearance with stamp of Tiddly Inks. 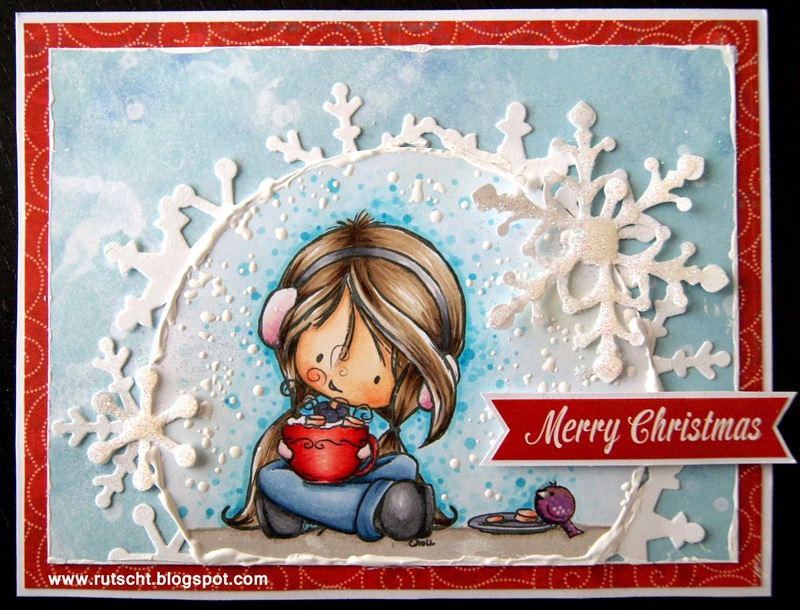 Card that has gesso, fairy dust, emboss frantage and some other product to give glitter, snow effect, etc. Skin: E11, E21, E00, E000, R11. Earmuffs and gloves: R81, R00. Background: BG01, B01, B00, B000, BG02. There are still a few days but: Merry Crhistmas! Hello everyone! It's Delphine here today to share a tutorial on a 100% Copic card with a simple airbrushed background - I absolutely love the look of airbrushed backgrounds! 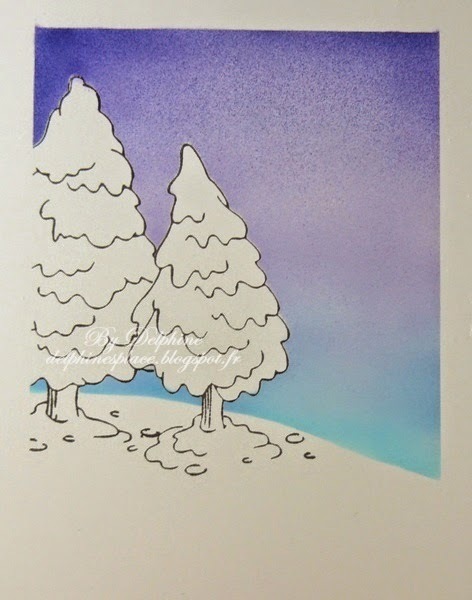 For today's example, I chose to do a simple winter scene with a character and just a couple of trees. Please note, I did not stamp and mask the character on my scene because I knew I wanted to add it at the end on 3D foam squares, but it is of course possible to stamp it at the beginning. Stamp the elements you need on your scene, starting with what you want to be in the foreground first. 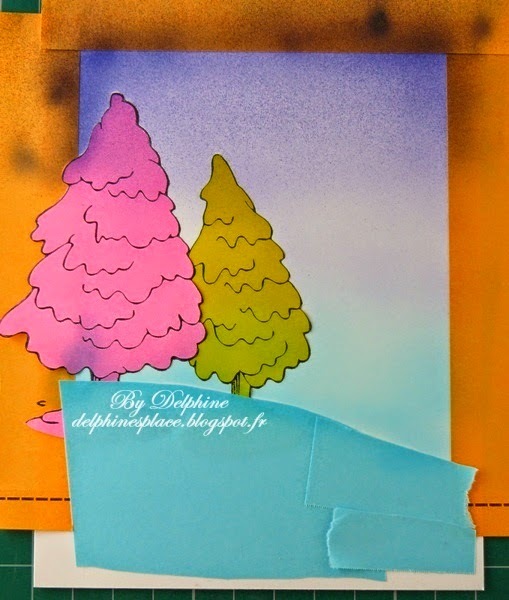 To mask, I used Post It Label Pads which have 100% adhesive backs, and picked different colours to show you clearly the different parts of the scene. Here, I stamped the little tree first where I wanted it, masked it (yellow), then I added orange strips around my "scene" to have an uncoloured frame at the end. 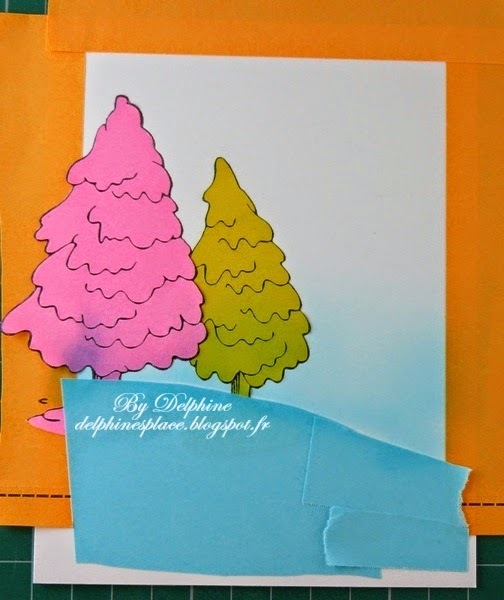 I then stamped the tree on the left and masked it (pink). I thought I would have a little snow slope, so I just cut and put pieces of blue Post It Notes to create the slope and protect it from the airbrushing. 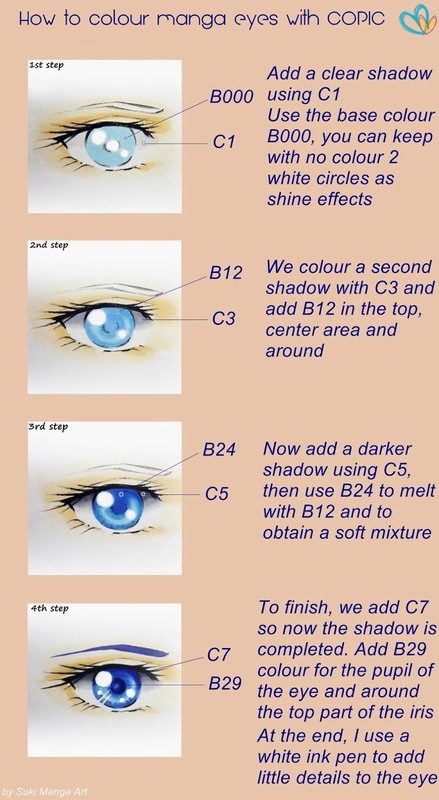 Airbrush your lightest colour B00 going from left to right and right to left from the bottom of the image and stop midway of your sky. I like using 2 different shades for airbrushed skies (here Bs and BVs) and I always start with my lightest colour, so I can darken the colour afterwards if necessary. Now start at the top of your image with your second shade - BV02 here - and go down little by little towards the blue area. 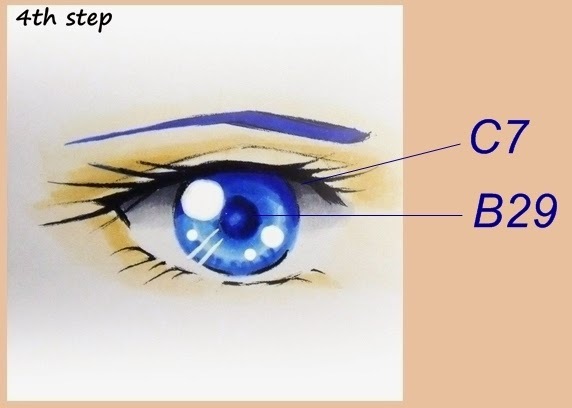 Airbrush over the beginning of the blue part so that your colours look blended. Take your BV02 again and go over all the BV04 and BV02 areas starting from the top and being careful to add enough BV02 on the transition to blend it a little and airbrush on the upper part of the blue area too. Now remove your masks and check the result of your airbrushing. 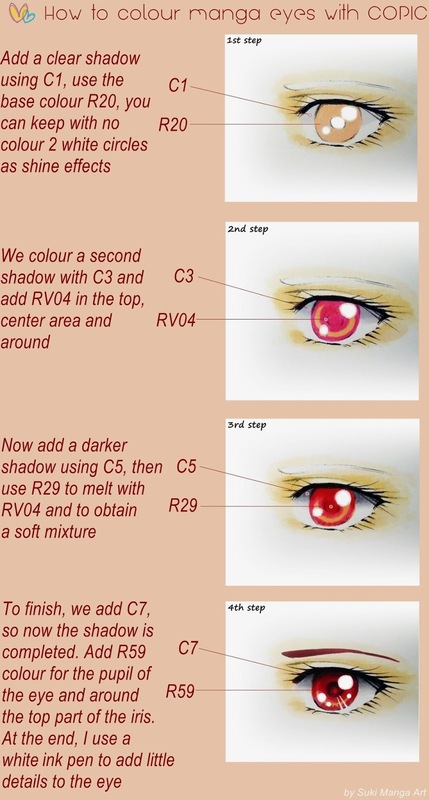 And now all you have to do is use your Copics to colour your scene.